“Don’t shoot me! Don’t kill me!” screamed a terrified Frances Scott as heavily armed men broke down the door of her home near Malibu, California shortly after midnight. Donald Scott, the 61-year-old homeowner, was startled awake by his wife’s screams. Although he was groggy from sleep and the effects of a “nightcap,” and his vision was blurry because of recent cataract surgery, Scott grabbed a loaded revolver and hurried downstairs to defend his wife. A few seconds later he was dead, fatally shot by an intruder later identified as Gary Spencer. The murder of Donald Scott, which took place twenty years ago today, occurred in Ventura County, which – according to the proud boast of District Attorney Michael Bradbury – was “the safest metropolitan area west of Ohio.” Bradbury was a famously aggressive prosecutor who disdained plea bargains and extolled the merits of capital punishment to anybody who was willing to listen. At the time he spoke those words, Bradbury was in the second year of what would be a four-year struggle to prosecute Diane Mannes, a woman who accidentally killed three teenagers in a drunk-driving incident, for second-degree murder. Disdainfully rejecting Mannes’s offer to plead guilty to manslaughter, Bradbury spent years and hundreds of thousands of dollars in a devoted effort to prosecute Mannes for murder – even after she was sent to prison on felony charges arising from the same incident. Eventually Bradbury was forced to accept a plea bargain in 1993. Bradbury should have made quick work of the Donald Scott case. The murderer and his accomplices had been identified, and were easily found. A five-month investigation by Bradbury’s office produced a 64-page report documenting that the people who invaded Donald Scott’s property were part of a criminal conspiracy to steal his 200-acre ranch, in addition to whatever other cash or assets they found in the possession of the reclusive millionaire. The invasion of Donald Scott’s death was an illegal act, Bradbury concluded. Yet he refused to charge those who committed that unlawful intrusion, and went so far as to describe the fatal shooting as an act of “self-defense” because the murderer was a deputy in the Los Angeles County Sheriff’s Office. For several months before the fatal assault on Donald Scott’s home, Spencer and his accomplices had tried to find evidence that the wealthy eccentric was cultivating marijuana on his property. In 1991, a year before she married Scott, Frances had been convicted of possessing a tiny amount of marijuana. Scott, however, had no history of marijuana use and was known to be “fanatically” opposed to the use of narcotics or cannabinoids. His mood-altering substance of choice was alcohol. An informant told them that Scott’s wife had been seen “flashing” $100 bills, which – although unwise – is neither illegal nor all that unusual, since the couple preferred to do business in cash. The Sheriff’s Office arranged for a DEA agent named Charles Stowell to conduct aerial surveillance of Scott’s ranch. Observing the property from an altitude of roughly 1,000 feet, without binoculars, Stowell claimed to have seen “flashes of green” that he believed were about 50 marijuana plants. Since any plants would have been obscured by a forest canopy, Stowell was apparently blessed with Kryptonian visual acuity. Two days later, another team – this time a deputy sheriff and a ranger from the Park Service – paid yet another visit, this time for the supposed purpose of buying a Rottweiler puppy. Rather than being secretive and inhospitable – as would befit people engaged in the production and sale of contraband – the Scotts were cordial to their unexpected guests, going so far as to give them a tour of the ranch. More than thirty officers from five different agencies – including the DEA and the Forest Service but not, significantly, the Ventura County Sheriff’s Office – took part in the assault on Scott’s home. Two of the participants in the attack on Scott’s home told Bradbury that the possibility of “forfeiting” the land was explicitly discussed during the pre-raid briefing. That briefing included a property-appraisal statement and a parcel map that noted the recent sale of a nearby 80-acre plot for $800,000. For years, Scott had rebuffed the Park Service’s offers to purchase his 200-acre ranch, which would be assimilated into the Santa Monica Mountains National Recreation Area. This fact explains why two Park Service rangers were among the motley assortment of costumed trigger-pullers who took part in the midnight raid. The assumption was that the property could be seized – and the proceeds divided among the participating agencies -- if the raiding party managed to find a total of fourteen marijuana plants on the premises. No marijuana was found that night, or in subsequent searches of the ranch, so the seizure of the property wasn’t consummated. 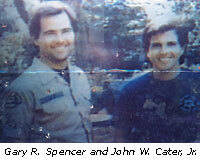 As a consolation prize, Spencer and his partner, Deputy John Cater, had to settle for a trophy photo taken outside Scott’s cabin. Beaming triumphantly, the deputies posed as “if they were white hunters who had just shot the buffalo,” in the disgusted words of former Los Angeles deputy district attorney Larry Longo. The prospect of grabbing Scott’s land caused Deputy Spencer to lose his “moral compass,” Bradbury suggested. “This search warrant became Donald Scott’s death warrant,” concluded the prosecutor. Every member of the task force should have been prosecuted as part of a criminal enterprise, and Deputy Spencer should have faced a charge of second degree murder. Yet for some reason, the zeal that had once driven Bradbury’s effort to prosecute a drunk driver for murder eluded Michael Bradbury. The shooting of Donald Scott was "justifiable homicide," Bradbury opined, because Spencer acted in "self-defense" and because "Scott was resisting Deputy Spencer in the execution of a search warrant." However, Spencer himself admitted that Scott was in the act of lowering his revolver (which he had initially gripped by the cylinder, rather than the handle) before the shots were fired. This would mean that Spencer shot and killed a victim who was neither "threatening" nor "resisting" him. Like practically everybody else in the business of official coercion, Bradbury believes (incorrectly) that a citizen has an unqualified obligation to submit to an unlawful search or arrest. "If a search warrant is improperly issued, then the occupants can obtain a remedy in a court of law," he piously asserted, thereby prescribing a problematic remedy for an unlawful raid that leaves the victim dead. He did concede that a "peace officer is not immunized for executing a search warrant when he acts with malice" -- and that Spencer's deliberate misrepresentations could meet that standard. Displaying a remarkably fertile gift for equivocation, Bradbury concluded that Spencer's malicious acts wouldn't justify criminal prosecution unless it could be shown that he employed "excessive force" -- such as fatally shooting a confused man who was lowering his gun, perhaps? Rather than building a criminal case, Bradbury cataloged his objections and called for a handful of trivial "reforms." “The Bradbury Report is so riddled with inaccuracies and misrepresentations that any thorough analysis raises disturbing questions regarding the investigation’s integrity and intent,” groused Sheriff Block. Apparently, Bradbury’s inquiry didn’t meet the exacting standards followed by Block’s office when it staged a lethal paramilitary raid against an innocent man’s home on the basis of assertions not far removed from the “spectral evidence” that played a key role in the Salem Witch Trials. Although California’s Republican Attorney General Dan Lungren effectively cleared the LA County Sheriff’s Office of misconduct, he rejected Block’s demand for a formal investigation and censure of Bradbury. Lungren did take a swipe at Bradbury for referring to Deputy Spencer’s perjurious search warrant as Scott’s “death warrant,” complaining that such “unsupported and provocative language is in my opinion both gratuitous and inappropriate." The real tragedy of the case, Lungren claimed, was not the killing of Donald Scott – who, after all, was a mere Mundane – but rather the unedifying public conflict between “two conscientious public servants who've done a good job in the past. It's very unfortunate that any aspersions were cast in the first place." Foolishly believing that he had been libeled by Bradbury, Detective Spencer filed a lawsuit, which was dismissed in 1996. Although he was driven into bankruptcy after being ordered to pay court costs, Donald Scott’s murderer has adamantly refused to acknowledge that he did anything wrong. From the perspective of this impenitent murderer, the raid was a success, and Donald Scott deserved to die. In response to a $100 million wrongful death lawsuit filed by Scott’s survivors, attorneys for Los Angeles County embarked on the now-familiar strategy of attrition – using every delaying tactic in its arsenal to draw out the proceedings and wear down the family. As the family’s attorney Nick Gutsue pointed out, this approach backfired: While the County stalled, the LAPD’s Rampart Scandal erupted, treating the public to a usefully lurid display of the criminal corruption that had penetrated into the marrow of law enforcement. In 2000, Dennis Gonzalez, the deputy counsel appointed to deal with the Scott lawsuit, agreed to a five million dollar settlement. By that time, Frances Scott had been reduced to living on a teepee on what remained of the family’s property. The Sheriff’s Office was willing to allow County taxpayers to cover the costs of the settlement. It petulantly refused to exonerate Donald Scott or to apologize to the family. During his tenure as Ventura County DA, Bradbury (who retired in 2002) was an adherent of James Q. Wilson’s “Broken Windows” theory of law enforcement. Just as unrepaired windows tacitly encourage vandals to shatter every remaining pane of glass – and eventually burn down the building -- unpunished minor offenses will abet lawlessness and threaten society’s very existence. The decades that have passed since Gary Spencer murdered Donald Scott in his living room have vindicated Bradbury’s theory in ways he either fails to appreciate or chooses to ignore. Rather than prosecuting Spencer and his accomplices for the major offenses they committed against the Scott family and the rule of law, Bradbury invented what has become the standard model of SWAT raid scandal containment. Twenty years ago, the plunder-focused raid that led to the murder of Donald Scott was seen as a horrifying anomaly. Today, such acts of state terrorism are routine. I wish to express my deepest gratitude to everybody who is helping to keep Pro Libertate on-line. Thank you so much! 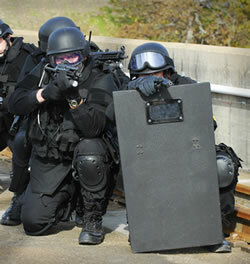 I want to buy a pair of kevlar pajamas. The Nazis were pros at the midnight raid. midnight invasion of Scott's home?" Who turned the dogs loose? Therein lay the primary culprit in this tragedy. is a public danger, obviously. Wouldn't do you any good, non de guerre. They'd just aim for your head. I remember this very well. Wasn't there a television documentary about it? And where oh where did Mr. Spencer slither off to? I guess Bradbury had the 'Broken Windows' theory partly correct, at least. 20 years ago a mafia comprised of agents of various state and county and city and federal bureaucracies murdered a man in cold blood in order to steal his possessions. Like a street filled with shattered glass, no members of the coterie were prosecuted and convicted. And what's happened since? More and more men and women and children (and dogs) murdered by other little mafia-styled 'families'. I too would love to know what that sicko Gary Spencer is doing with his time these days. An evil, evil man to do the bidding of the State. There is competition, and a change in use, regarding the term goon -- as the police or the gangster.